Keep up on the latest news on HAHMGS and gaming in the Borderland area. Convention theme: Back to the past!! SATURDAY MAY 3RD. 11am signup, Noon start. Theme - The Enemies of Rome! The tournament is open to Book Two 15mm armies, that are listed as Enemies of Rome. DBA rules version 2.2 will be used. Their will be four one hour rounds. The tournament has openings for 10 players. Tournament Winner will receive a Painted 15mm army. Loaner armies will available to those who might need one. Sealed Deck will be using Versus (the ones produced currently) decks. For $20 you get your choice of Versus deck and 2 Booster Packs. Contact HAHMGS to put on a game at the show. Doors open at 3pm Friday! The BIG worldwide version. The one they stole from the late Mike Duffield. As the AXIS, can you crush your enemies, drive them before you and write the epitaph of the free world? As the ALLIES, can you stop the AXIS juggernaut, drive them back to the abyss from whence they came, and write the history books for all to read in the future. ALL DAY FRIDAY, ALL DAY SATURDAY, & ALL DAY SUNDAY THE GAMES WILL RUN CONTINUOUS FROM 1 SESSION TO THE NEXT. 2ND EDITION OR THE ALPHA 3 RULES WILL BE USED. Batko is fighting with his sabre! Greens vs Whites in Ukraine during the Russian Civil War. Quickplaying rules. Carrier air-strikes, Battleships-battling, Kamikazies, Submarines, day & night actions in the Phillipines using Lou Coatney's The greatest naval battle of ALL TIME!! rules. Saxons vs Prussians in the War of the Austrian Succession as the Old Dessauer attacks the Saxon Army outside Dresden. Doors open at 8am Saturday! For two to four players. Two evenly matched Napoleonic armies. Games take two hours or less. No experience necessary. The latest from Rothery award winner George Knapp. Using his effortless to learn, a lifetime to master rules system! A can't miss game! This event will be running all day on saturday with one game after another. On the right was Marshal Davoust, who, marching against the enemy, was either warned, or else met them coming towards him. To Davout's surprise, while he maneuvered to strike Rosenberg's corps, Rosenberg attacked Davout! Rosenberg's attack had wrong-footed the French. As soon as the skirmishers of the leading battalions had pressed in, the columns came forward. The Austrian infantry marched with enthusiasm, bands playing, and senior officers riding at the front. Davout's artillery greeted them with a hailstorm of projectiles, and battle was joined! Warm up for the DBA tourney with a fast paced ancients miniatures games. The game will be based on Commands and Colors Ancients Rules and will be played on a three dimensional game board. After the rude rebuke at Marathon by the Greeks to his kind offer of allowing them to become one of the subject peoples of his empire, Darius delayed his planned conquest of Greece to shift his focus to other imperial matters. One of these matters was dealing with the Scythians and how to convince them to likewise join his empire. To protect New York City and the lower Hudson valley from the British forces massed on Staten Island, George Washington has sent his small army to defend Brooklyn Heights, on Long Island. Sir William Howe has landed at Gravesend while the British fleet under his brother, Richard Howe, is shelling New York. What happens next will decide the fate of an entire continent and the whole world! It is May 1941. The German Army is tasting victory at every turn...but the Kriegsmarine is living in its shadow. Hitler husbanded his navy, instead of wasting it early. "Now is the time" Hitler feels. He orders his surface wolves out upon the Atlantic, to wreck what havoc they may...if they make it. This is a "alternate history" scenario. The rules are fairly easy, as the vessels are rated for hull, armor, firepower and speed. Gunnery is based off range "bands". There is a strategic element, as you will have land based, carrier based and float planes to conduct searches for the opposing forces. Each side will have a "core" force, that can be altered by "force augmentation" rolls...but beware there is good as well as bad! Strategic turns equal 4 hours per turn and tactical is 5 minutes per turn. Strategic movement will be conducted by a "blind" system, where the opposing forces will hand in orders for movement and search to the referee and then each side will be informed of the results secretly. Emphasis will be on playability and speed of play. The Shogun lost his grip on power and has now had to resort to allies. He has taken to the field near Hikone Castle (clan: Li Naotsugu). The threat is an alliance of many clans. The challengers have a number of reasons to fight, but one is to capture the Shogun. The shaky alliance just might pull it off! Can the Shogun remain in power? This classic game of pure negotiation. If you know how to write, and how to stab someone in the back while shaking thier hand, then you already know how to play. In the game, players represent one of the seven "Great Powers of Europe" (Great Britain, France, Austria, Germany, Italy, Russia or Turkey) in the years prior to World War I. There are only two kinds of military units: armies and fleets. On any given turn, each of your military units has limited options: they can move into an adjoining territory, support an allied unit in an attack on an adjoining territory, support an allied unit in defending an adjoining territory, or hold their position. Players instruct each of their units by writing a set of "orders." The outcome of each turn is determined by the rules of the game. There are no dice rolls or other elements of chance. It's the most pure wargame and RPG ever, at the same time! Using Lou Coatney's The greatest naval battle of ALL TIME!! rules. November, 1943, Eastern Front: Fourth Panzer Army is ordered to recapture Zhitomir. It has been given the largest concentration of armor available, including the 1st, 7th, 19th and 25th Panzer Divisions, the 1st SS Panzer Division LSSAH and a battlegroup from the 2nd SS Panzer Division Das Reich. The opponent is the Soviet 3rd Guards Tank Army. Quick to learn rules make this game a great introduction to historical miniatures. And it's operational scale is a fresh approach to pushing lead for experienced miniature players. The Germans Try to break through to the channel ports in October 1914 to cause the British defenders to return to England and win the war by Christmas. The attackers are newly raised troops from the college student volunteers with little training. The British defenders are what is left from the old regular army after the August battles. Few in number, but with 30 aimed shots per minute, the Germans attackers thought they were attacking machine guns. Gangsters: Mad Dogs With Guns! ACW, Napoleonic, WWII, WWI, 7YW, AWI, Steampunk, DBA & More! All games and times subject to change. And how! Hey! We love boardgames, and we might just throw down anytime, anywhere. So we'll have a bunch of for anyone to enjoy. 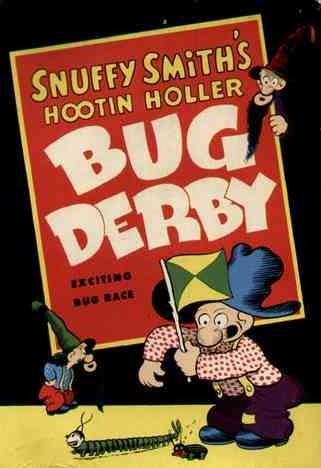 Snuffy Smith's HOOTIN HOLLER BUG DERBY! Jr's Collectables. Highlander and magic cards! Contact HAHMGS to be a vendor at the show. Heart of America Miniature gaming Society (HAHMGS) is a not for profit corporation registered in the State of Missouri. The purpose of this society is to promote historical gaming in miniature and the study of military history. Towards this goal we maintain this website and sponsor the Borderwars Game convention.